I woke up the next day in Angers – said goodbye to my hosts but it was raining like god forgot the tap on and he doesn’t pay the bills. A pity I couldn’t fully explore Angers but that gives me another reason to come back, right? 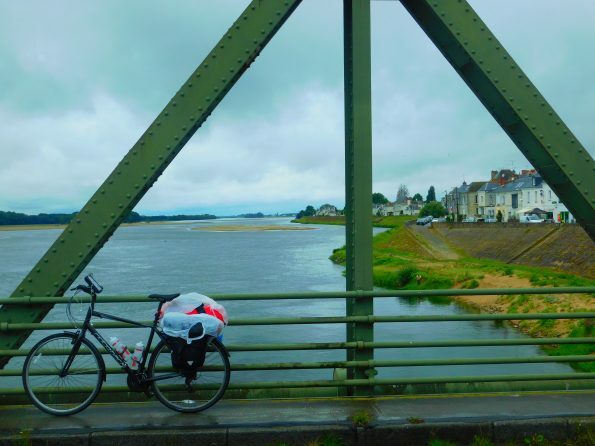 I hit the road to reach the Loire and finally merge my path with EuroVelo 6. 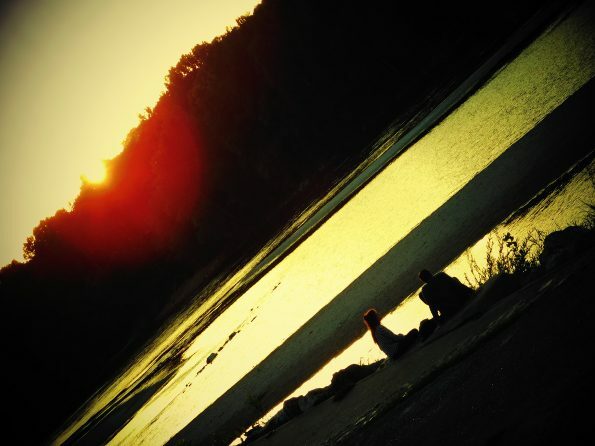 And what a sight the Loire is! It’s called the “Garden of France” and is studded with over a thousand châteaus, which means that the eco-system around it is rich and plentiful. 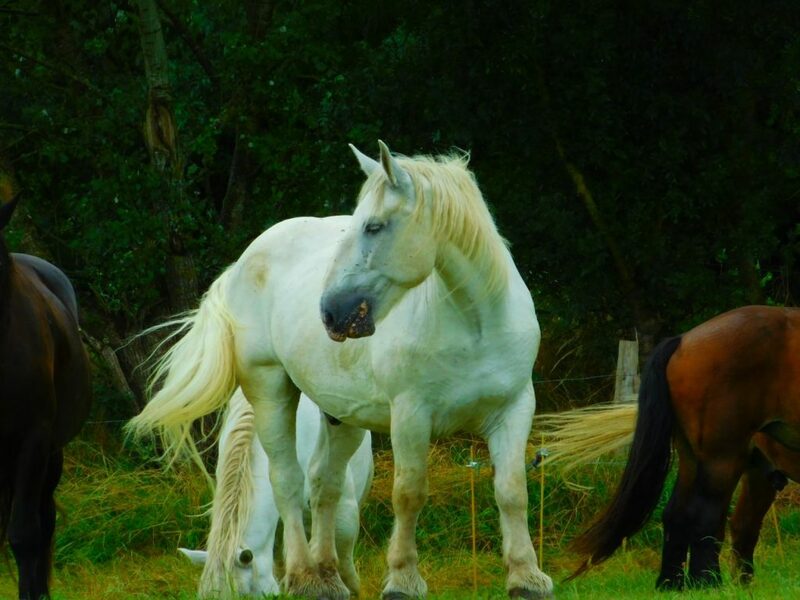 Horses, dears, cows and wild cyclists populate the valley to set a vibrant, colorful landscape. 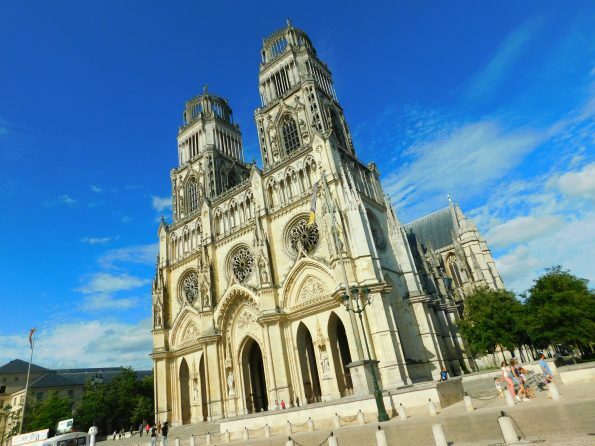 My first stop was Saumur – it’s worth mentioning that every 20 km you pass a castle on the Loire (thus the castle valley) but for me, Saumur stood out. With a bohemian atmosphere, boulangeries and cafés “slowing” the cyclists down. It did offer me the chance to be silent and sink everything in. I got so absorbed by it that I “got lost” for about one hour trying to navigate out of it! And that’s not all, I took so many pictures that I kept taking the camera in and out of my bag. Silly old goose, forgot the zipper open and guess what a French couple were desperately trying to show me? My wallet and passport on the road chilling in the sun. I saw my life flashing in front of my eyes. 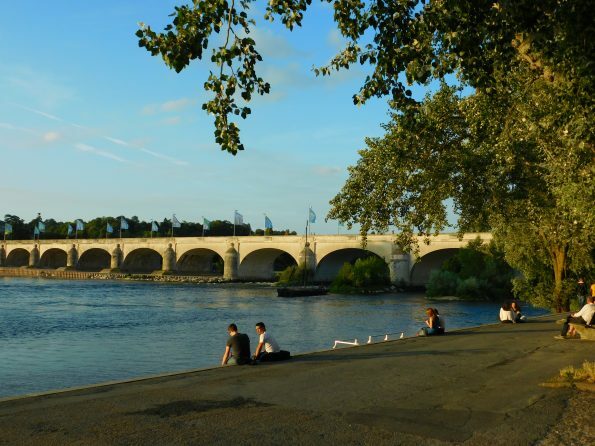 I have managed to quiet myself down by camping on the Loire and I fully immersed myself in the traveler’s life, washing my clothes in the river – therapeutic activity really. In order to fully immerse in my position, imagine cycling next to a river, cyclists every other minute, each of them receiving the well-deserved “Bonjour” from me. As you would approach any village, the first sight would be the arch-stoned bridge and the cathedral’s or castle’s tower. Cycling on those bridges is such a surreal experience. You got the Loire, left, right and under you, the town or city in front of you and the old bridge completing the National Geographic-like footage. Translating a Romanian expression “life beats the movie”. 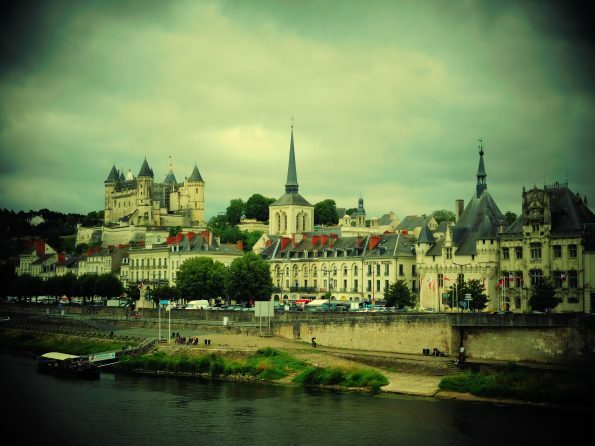 Tours was my next overnight stop – a animated city with bars and terraces up and down the Loire. Seeing the sunset whilst eating a French platter made my day! You see, the problem with beautiful cities is that you look left right, backwards and don’t pay attention to where you are going. That was the intrigue (listened to too much Sherlock Holmes on the bike) behind my graceful pavement kissing. Good place to have my first fall. Next day I pegged it down to near Orleans, on the way seeing the Blois castle and continuing on the “unique landscape that only the Loire can provide” (Ghita, 2017). And this is where my favourite experience of my trip so far happened. No, it wasn’t in a castle or gothic cathedral. It was at my next Warm Showers host. Meet Clement, Isis and Yaelle – a family that have just come back from traveling for 18 months on their bikes. Really jolly and living in a farm, they were quick to put a smile on my face, smile that hasn’t really disappeared for the entire duration of my stay. Although they were hosting another couple, they have unconditionally welcomed me, fed me with delicious vegan food (I am thinking of becoming vegan now) and spent a wonderful evening chatting about the beauty of life and where to find it. At the end of the evening, after my dish-washing abilities have been put to good use, Clement said he fancies going to a concert. We jumped on our bikes and left the stars to guide us. You have to understand that both Clement’s and Isis’s English is impeccable and there is no language barrier – but as it happened, there was a barrier, a metal one in my way to be more specific. I think it was just Clement’s way of testing my brakes and reflexes but after kissing the pavement I happily nearly miss kissing the barrier. But the funniest thing is that I asked him 30 seconds before the “near death experience” if there is any barrier in the way and with confidence he denied it. It’s safe to say that we used our lights for the remaining of the road and I couldn’t stop laughing to the point of having stomach cramps. The concert was held in a little garden on the right side of the Loire. with lights and candles the sight was charming but let’s move to the real center of attention – the performance – oh dear! I was privileged to witness a “ritual” executed through a lady singing a hymn dedicated to animals. People were wearing masks and were transcending into the worshiped animals. Not going to lie, it was a wonderful and weird experience and of the most uniqueness. You can see it for yourself! But the highlight of the night was meeting 2 fellow – cyclo-travelers. They are on a mission to experience the French culture the unique way. Their names are Florian and Benjamin and they fully inspired me! For the last 3-4 weeks they haven’t spent any penny, dime, cent or rupee – whatever you want to call money – on food. They try to reduce food waste wherever they go. “We live like kings” Benjamin says.” We usually go to the market and ask the traders if they have slightly damaged merchandise that they cannot sell. After explaining their cause, they get even more food than they asked for. “If we need bread, we go to the bakery, if we need pasta, we go to a small shop. 9 out of 10 cases people are helping us – it’s all about asking it nicely and connecting with people the right way”. I honestly thought this is fantastic! I was seriously thinking of joining them in their quest but going to Spain is quite a detour for my route. You can check their story up and their blog here. The next morning, I felt so appreciative for my stay that I insisted helping around the house. So we built a wall and a door for the little Yaelle’s play house. It was so enjoyable and satisfying to give something back and make them happy (3+ on my smile meter). I do hope your roads will be crossing my path at one point! 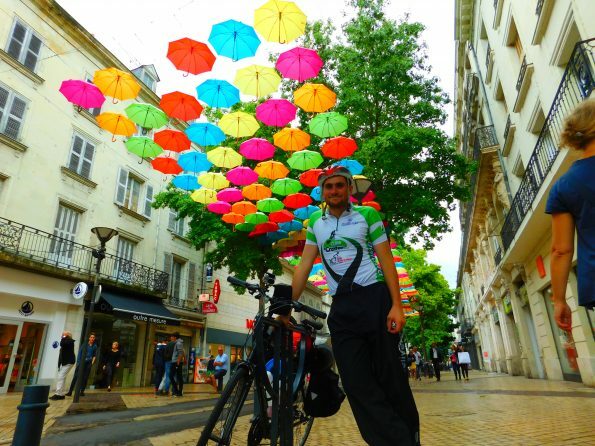 Check their inspirational story of how they lived their life on bicycles here. I am so grateful to have the chance to meet them! I have learnt that their way of being happy is making other people happy! It really shows that you don’t need a lot to smile! Dear readers, I would like to know what sort of questions you would like me to ask the people that I meet on my way! Any curiosity, let me know in the comment section below and I will do my best to inquire answers for you!